It doesn’t matter if you’re a serious wine connoisseur or don’t know the difference between a burgundy and a brut; both types of people populate Napa’s tasting rooms to sniff, swirl and sip their way through this bucolic countryside, before retiring to one of the top-notch restaurants at night for even more wine and mouthwatering cuisine. That’s Napa — and from a purely decadent point of view, it simply can’t be beat. 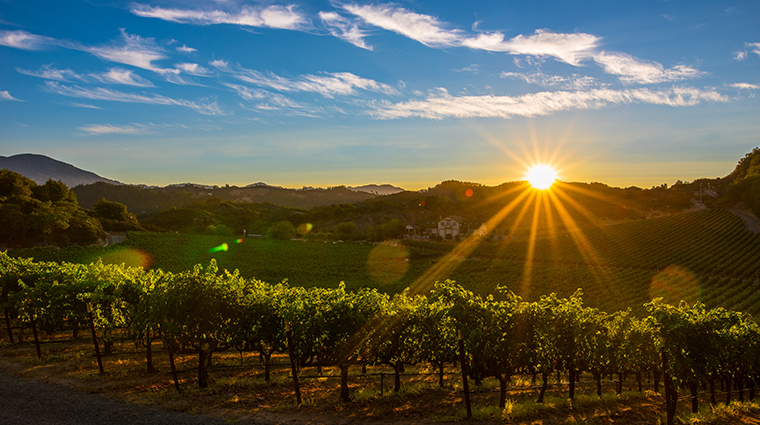 With more than 200 wineries, Napa is one of the most famous wine regions in the world. You’ll find all the major names in the business here — Mondavi, Krug, Beringer. There are the large estates that look like they were transported from Italy, but there are also the smaller, less grandiose wineries that throw open their doors to guests. On the other hand, a few places keep them tightly shut, sealing in their “cult” status. It’s a large, varied wine country (and not just in terms of soil), with much to see and taste. Several small towns actually make up what everyone simply refers to as “Napa.” The Napa Valley is about 30 miles long and includes the towns (from north to south) of Calistoga, St. Helena, Rutherford, Oakville, Yountville and Napa. Each has its particular charm. Calistoga has spas and hideaway hotels; St. Helena is full of shops; Yountville is something of a culinary mecca, lined with exceptional restaurants. Add to this the magnificent beauty of the place, and you’ll want to make trip after trip to this wine capital.